Roadrunner’s Performance Diesel Torque Converters continue to lead the way in innovative design and are built to handle high horsepower and torque produced by diesel engines. Our Bad Boy line offers four lock up linings for the ultimate in clutch holding capacity. Stall speed is lowered to match the torque curve which results in better performance and fuel mileage as well as extending the longevity of your engine. Billet steel input splines are full braced to turbines for unmatched longevity. This diesel torque converter has all possible upgrades and built one at a time for trouble free performance. Allison transmissions featured in your GMC and Chevy trucks offer legendary reliability, pair them up with one of our high GM high performance diesel torque converters. Our diesel performance converters have 4 lock up clutches and the the power down right. Our top of the line Dodge diesel performance torque converter will help get the power from your Cummins diesel and get it to the ground. Featuring a 4 lockup clutch system it will handle the power with ease. Get the torque and power on the road right. This is the top of the line diesel performance torque converter for use with your Ford Powerstroke diesel truck. It features 4 lockup clutches and will handle anything your truck can throw at it and reliably transfer the power to your 5R110W Ford transmission. Truly top of the line, our diesel torque converters will dramatically improve the performance of your diesel powered vehicle. 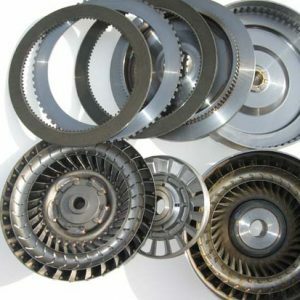 We are the torque conversion leaders and experts in the Phoenix area because of the shared passion of everyone involved with Roadrunner Converters. We truly believe in what we do and being the best at it. We guarantee you will be satisfied with the results you get from our team here at Roadrunner Converters and back up our high performance diesel torque converters with a 3 year limited warranty. I was in a real bind.. Trying to get my converter rebuilt in 1 day due to having to return the shop space I was borrowing the next day. Having been in Customer Service I know all customers want their stuff finished yesterday! So I am really hesitant to ask for “special fast service” just because I know how it feels to be on the receiving end of it. These guys made an exception for me understanding my predicament and actually turned my converter around in less than a day giving my job priority! Thumbs way up for going above and beyond excellent customer service! Pleasure doing business with you! – Manuel V.